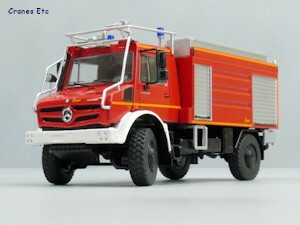 Mercedes-Benz Unimog Special Vehicles Video. [Youku Video]. 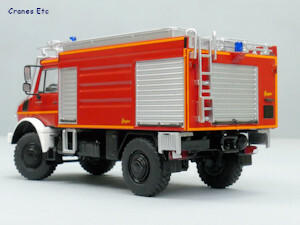 Unimog 5000 cab is good. Convincing chassis is almost all metal. Spraying nozzle is not adjustable. 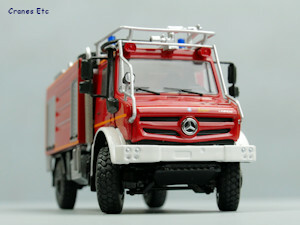 This model is a Mercedes-Benz 4x4 Unimog U 5000 series which is billed as the extreme all-terrain version. 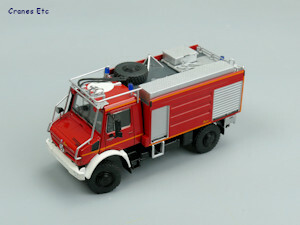 It is configured as a fire service vehicle. 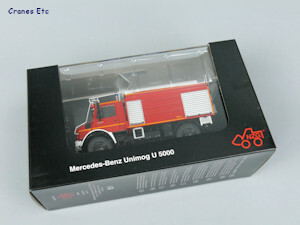 This version of the model is delivered in a NZG-branded box with an outer shipping carton. Inside it is held within a plastic display case. 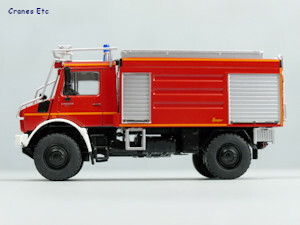 It has a detailed 4x4 metal chassis which includes the drivetrain, and it has the high ground clearance typical of an all-terrain truck. The wheels are metal with nice heavy tyres. The front grille looks authentic and the Mercedes-Benz logo looks sharp. There are metal grab rails running to the roof. The cab has finely painted door handles. Inside the cab the Mercedes-Benz logo on the steering wheel is just visible. Behind the cab the fire equipment body is modelled well with nicely detailed roller doors, and at the back there is an access ladder to the roof. 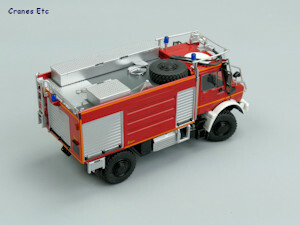 The roof has boxes, a spare wheel and a fire fighting nozzle. 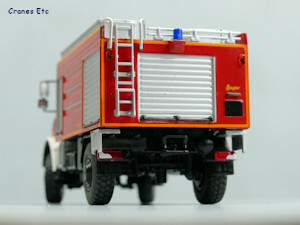 The rear lights have good looking plastic lenses and there is also a towing hitch. 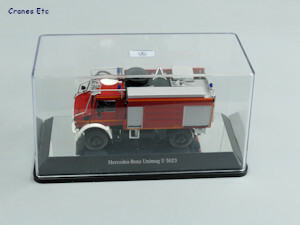 The plastic display case is good quality and it includes a name plate which denotes the Unimog as a U 5023. 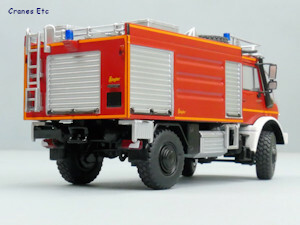 The Unimog rolls well and the steering also works well and achieves a very good angle. Each wheel is independently sprung with a good range of movement. 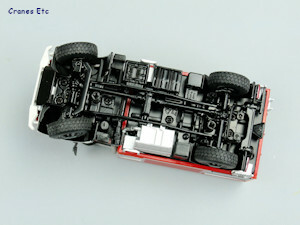 The model can be displayed in its display case, or removed by undoing two securing screws. It can be posed towing a suitable trailer. This is very good quality model from NZG with a high metal content so it is heavy for the size. The paint is very good and the graphics are very sharp with the exception of the tiniest ones. 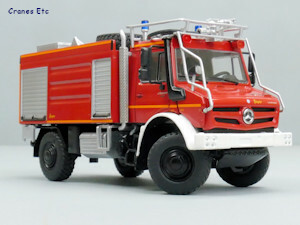 This is another interesting Unimog model and it looks convincing as a piece of fire equipment. The model casting first appeared in July 2015. Towing hitch and ladder at the rear. Steering angle is very good. Spare wheel and boxes on the roof.